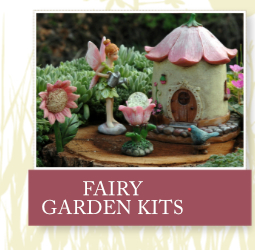 Fairy Homes and Gardens is dedicated to helping you create memories that will last a lifetime and bring joy and magic to your garden, with enchanted miniature fairy garden supplies. Founder and CFO (Chief Fairy Officer) Ronna has been enamored with fairy magic since she was a young girl, spending summers in the wooded countryside with her cousins and receiving innumerable treasures of shiny pebbles and delicate flower petals, as gifts from the fairies she encountered there. 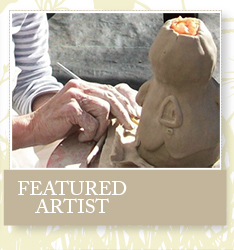 These fairy treasures prompted her to create her own fairy garden when she returned to the city, and it's a passion that has continued throughout her life. Today, she's dedicated to helping others discover fairy magic for themselves, and guiding others in creating a fairy garden in their own backyard (or on a city balcony!) Whether you're building a fairy garden for the first time, or adding something new for your miniature fairy guests to enjoy in an existing garden, our extensive collection of fairy houses, fairy garden accessories, complete fairy garden sets, living miniature plants and fairy figurines will be sure to enchant, encourage imagination, and bring untold delights to all those who visit. Whether for yourself or a loved one, miniature fairy gardens are the perfect gift to provide a daily experience of magic and delight in the wonders of the natural world. Fairy gardens are ideal for inspiring both the expert gardener in your life or building an early appreciation of gardening in small children. That's why we've gathered the finest, most durable fairy garden supplies from trusted suppliers, so they'll stand the test of time and weather. This extensive collection of enchanting miniature fairies, fairy cottages (even lighted solar fairy houses! ), and themed fairy garden sets are well suited for creating a DIY fairy garden in a planter or terrarium, on your patio, or in a quiet corner in your existing garden. The only limit in making a fairy garden of your own is the boundary of your imagination. Have a garden theme already in mind? Love Alice in Wonderland, or the magic of Oz? Perhaps your children are inspired by the delightful misadventures of Peter the Rabbit or the oceanside magic of mermaids? 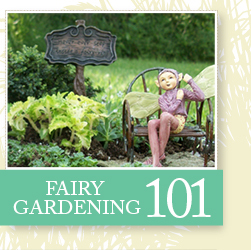 We've got a complete collection of themed fairy garden pieces to add character and whimsy to your garden. Of course, what would a fairy garden be without any residents? From miniature fairies to garden gnomes, to magical tiny animal figurines, you'll find the perfect miniature companions for your garden to peek out from cottages, wave hello from a leafy hiding spot, or perched atop a lily pad. And don't forget the accessories, sized to fit perfectly with your miniature fairy garden pieces. Our selection includes gazebos, birdbaths, fences, gates, fairy doors, bridges, miniature gardening tools - even outbuildings like greenhouses, schoolhouses, and much more. We hope you enjoy your experience shopping with us at Fairy Homes & Gardens and build a fairy garden that delivers delight and magic year-round. Thank you for your visit!